A Southern California couple accused of beating, shackling and starving their 13 children as captives in the family’s home pleaded not guilty on Friday to dozens of charges of torture, false imprisonment and abuse. David and Louise Turpin, who were arraigned in Riverside County Superior Court, could face life in prison if convicted on all counts. 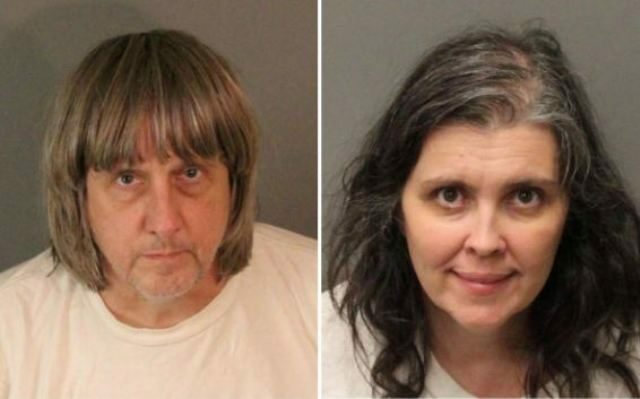 Sheriff’s deputies raided the Turpins’ home in Perris, about 70 miles east of Los Angeles, in January after one of the captive siblings, an emaciated 17-year-old girl, escaped through the window of the dwelling and called authorities. Deputies found the girl’s 12 brothers and sisters – ranging in age from 2 to 29 – trapped inside the darkened, foul-smelling house, some of them chained to beds. The siblings, found to be suffering from malnourishment, muscle wasting, stunted growth and other signs of severe abuse, were taken into protective custody and the parents were arrested. Prosecutors said the victims had been denied proper nutrition, basic hygiene and medical care and were harshly punished for perceived infractions such as wasting water by washing their hands above the wrist. The couple also were accused of taunting their children with pies and other food that they were forbidden to eat. Defence lawyers have never offered an explanation for the circumstances alleged by authorities. David Turpin’s parents, James and Betty Turpin of West Virginia, have said in media interviews that their son and daughter-in-law were a deeply religious couple who home-schooled their children and required them to memorise Bible scripture. The defendants were each charged with 12 counts of torture, 12 counts of false imprisonment, seven counts of abuse of a dependant adult and eight counts of child abuse. Louise Turpin, 50, also faces an assault charge. David Turpin, 56, who worked as an engineer for aeronautics and defence contractors Lockheed Martin and Northrop Grumman, also was charged with one count of committing a lewd act on a child, plus eight counts of perjury over his claims that he was running a private school with his children as the students. The couple entered not guilty pleas to all charges and denied all allegations on Friday, said John Hall, a spokesman for county prosecutors. Judge Bernard Schwartz denied a defence motion to try the perjury counts apart from the other charges. Hall said the next court date would be Oct. 5 for a trial-readiness conference.